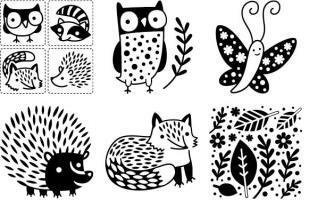 Set of 6 different rubbing plates. Use them to rub on paper or fabric. You can also use them to add texture to your projects, including polymer clay and hand-made paper. This set contians 4 large animal figures, 1 large leaf plate and a special set of 4 mini-plates. Use the mini-plates in the 4-patch arrangement right out of the package - or cut them apart to make 4 small rubbing plates. They're perfect for small projects  or to decorate children's clothes!